Coronas-Photon (Russian: Коронас-Фотон) or Complex Orbital Observations Near-Earth of Activity of the Sun, is a Russian solar research satellite. 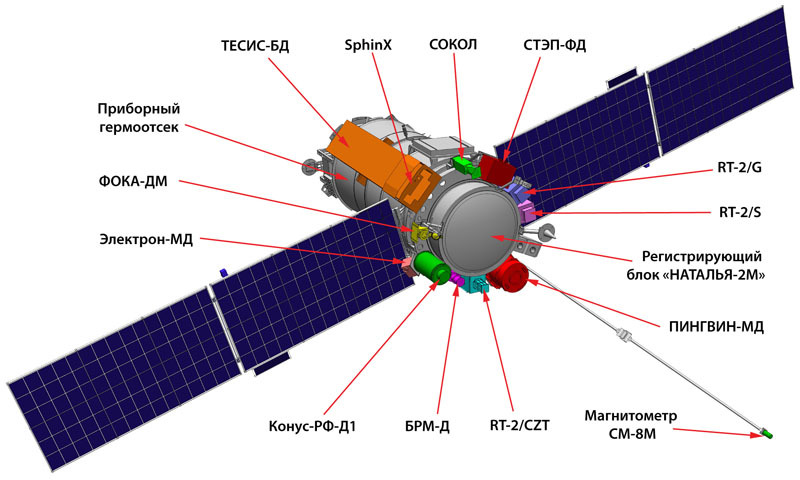 It is the third satellite in the Russian Coronas programme, and part of the international Living With a Star programme. It was launched on 30 January 2009, from Site 32/2 at the Plesetsk Cosmodrome, aboard the final flight of the Tsyklon-3 rocket. The goal is to investigate the processes of free energy accumulation in the sun's atmosphere, accelerated particle phenomena and solar flares, and the correlation between solar activity and magnetic storms on Earth. Launch occurred succesfully on 30 January 2009, and the first batch of science data was downloaded from the satellite on 19 February 2009. The satellite operates in a 500 x 500km x 82.5° polar low Earth orbit and is expected to have a operational lifetime of three years. Coronas-Photon is a successor to the Coronas-F and Coronas-I satellites, launched in 1994 and 2001 respectively. It is being operated by the Russian Federal Space Agency, the Moscow Engineering Physics Institute and the Research Institute for Electromechanics. It was built using a bus constructed for Meteor-M weather satellites. Coronas-Photon hosts a wide range of experiments, including Electron-M PESCA conducted by SINP. Coronas-Photon also carries three Indian Roentgen Telescope or RT instruments: RT-2/S, RT-2/G, and RT-2/CZT. These will be used to conduct photometric and spectrometric research into the Sun, and for low-energy gamma-ray imagery. These instruments will be operated by the Indian Space Research Organisation (ISRO), and were constructed by a collaboration of the Vikram Sarabhai Space Centre, Tata Institute of Fundamental Research and Indian Centre for Space Physics. Data available from 2009-03-04 till 2009-11-30.